Hello ambassador of the Haliburton Highlands. Enjoy meeting new people and being a part of a team? Can’t get enough of our beautiful Canadian winters? Get in on the action and join us as we celebrate Canada’s biggest and best outdoor version of our nation’s favourite pastime! 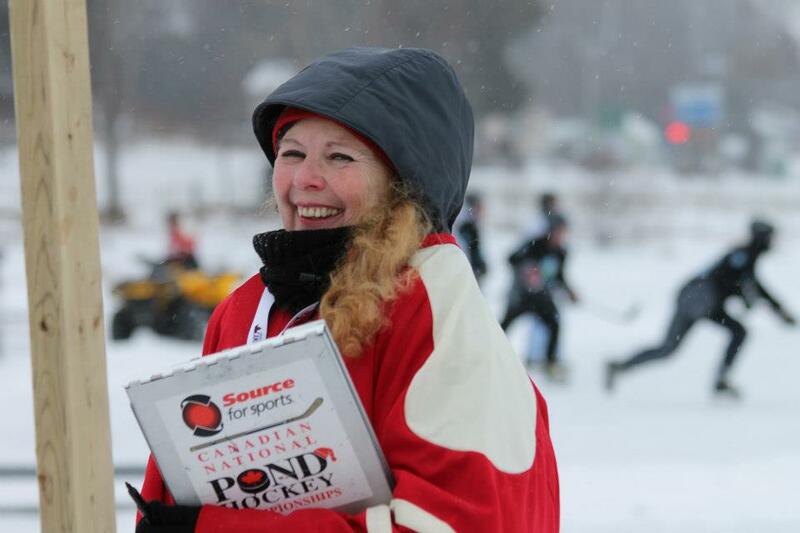 It is no secret that the success of staging an event like the Canadian National Pond Hockey Championships relies heavily on the support and efforts of an incredible team of volunteers! You had me at Hello – Let’s register! 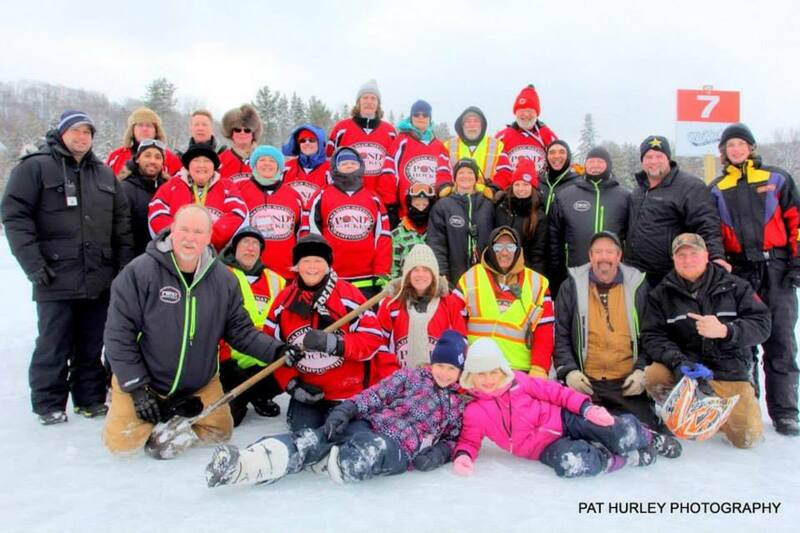 One of the largest pond Hockey events on the planet! Teams from 18 US states and over a dozen countries (including Botswana and Japan) have played in the event. Past celebrity players included Jim Cuddy (Blue Rodeo), NHL Alumni Vincent Damphousse, Dennis Maruk, Mark Napier, Jack Valiquette, Lou Franceschetti, Gary Leeman and Scott Thornton. Social Media – The World Was Watching… A Lot! Over 45,000 engagements on our Facebook page. Videos were viewed over 29,500 times. Event was followed by fans in over 42 countries. Over 12,000 social media connections and growing! 91% of our Facebook fans are Canadian. 83% of our Facebook fans reside outside the Haliburton Highlands. 78.4% of players would consider coming back the area (with friends or family) at another time of the year. 92% of teams were from outside the area and stayed with local accommodators for a minimum two nights. 56.8% of players indicated they had/would consider the purchase of a home or cottage in the area. 92% of teams indicated they will be back in 2018. 81% of volunteers participated to “help the community”. 85.7% of volunteers participated because they “like” the event. Exclusive CNPHC Volunteer hockey sweater. You can’t buy these! A THANK YOU “Swag Bag” from our sponsors and the CNPHC team. Exclusive invitation to the Saturday night Pond Parties at Pinestone. A thank you dinner party/dance (later date). • Help check-in and welcome teams to the event. • Ensure all teams provide signed waiver forms and identification. • Hand out team gifts and information packages. • Direct them to their assigned tasks. • Assist in keeping the volunteer room topped up with warm drinks and goodies to help fuel this awesome team of people! This is a great opportunity to enjoy some up close moments with the teams and this fast paced game of hockey! We are seeking volunteers who are prepared to work outdoors during the tournament as there are many “on-ice” positions available. This is where all the real action happens and the place to be if you are a fan of the game! Required to be rink side during game play to keep official score and to ensure fair play. • Will help keep games flowing, toss in puck when required and assess a penalty when needed. • Ensures team Captains agree with final score and sign off on score sheet at the end of each game. • Vote on the “best uniform” and most “sportsmanlike” teams for the event. • Gather completed score cards at the end of each game and deliver them to the tournament scheduler at HQ so scores can be updated in real time. • gather stray pucks and keep puck buckets topped up at each rink. • May also be asked to assist the CNPHC Ice Crew/Site Team in patching ice surfaces when required. • Oversee and support 4-6 rinks. • Someone who is versed with the rules in the game of hockey and understands how the game is run. • Your experience will be used to help monitor game play and ensure friendly competition, good sportsmanship, compliance to rules and to reinforce calls made by scorekeepers. • If needed, this individual will help settle disputes and eject players or teams if required. • Must be a confident individual – prior experience an asset. Perfect for those looking for a variety of things to do but primarily focused on setting up and tearing down of the site. • Place garbage cans & recycling bins at each rink and other locations at the venue. • Deliver 2 hockey nets to each rink. Put away each night. • Deliver benches to each rink. • Store nets, pucks etc. • Additional roles and responsibilities to be determined on site. Not sure what you want to do but want to do something? Your time is flexible? Why not be a free agent? We always have something we’re looking for help with. We’re looking for responsible individuals to assist in maintaining/cleaning our rinks. • Experience in safely operating ATV’s and/or snow removal equipment (tractors). • Ice crew is responsible for sweeping 10-16 rinks every hour. • Ensure machines have adequate fuel and are report any repair issues when they arise. • Report any ice condition issues to Ice Crew Manager. • Keep area around the rinks, pathways swept. Volunteers under 16 are eligible however, they must be accompanied by an adult. Training will be provided for all positions – date, time and locations TBD as we get closer to the event. Students: We can sign off for volunteer hours. Being part of a community means doing your part for the community. In addition to bringing tourists to town and supporting jobs in our local businesses, we are happy to support the Central Food Network and Heat Bank Haliburton County. Together, Central Food Network and Heat Bank Haliburton County provide emergency food, heat (wood, fuel, propane) and other services to hundreds of Haliburton County households each year. 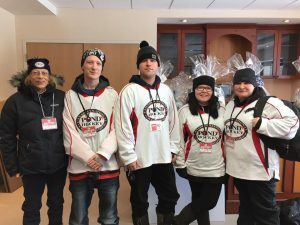 They also help people break the cycle of poverty by provide workshops, assistance in applying for Hydro rebates and other programs that give people options they often did not know they have. 100% of online auction proceeds are donated to these organizations. We offer free use or our CNPHC equipment (trailers, vehicles) to assist. Helping to deliver wood to households experiencing a heating crisis. ARE YOU A HIGHSCHOOL STUDENT 16+?